Suddenly saw a photo of the food we ate at Hoshino Cafe and decided to talk about it. Located at the new side of Plaza Singapura at Dhoby Ghaut, i've always wanted to visit Hoshino Cafe since their pancake looked REALLY fluffy and yummy. Plus, the queue was always really long. Singaporean style : got queue means got deal (jk). 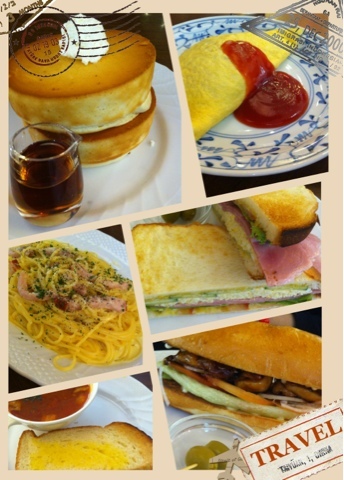 We had a variety of food - i ordered Carbonara spaghetti, Sen ordered Omelette rice, Shizu and Rin bought sandwiches. We managed to order a 2-layer fluffy pancake too!! I personally think if you're there for their 'cafe' menu, it's actually pretty pricing, but looking at how yummy all their things look, I think it is pretty okay and worth the try! Their main course are reasonably priced! But there isn't too much variety for main course. I wanna go back there again though!